I always liked visiting Tucson when the LPGA played at Randolph Park. Spent a few winters there also and loved it. Worked the front desk at the Palm Court Inn a couple of off-seasons. That was an experience. Even had a murder during my tenure. Don’t think it was ever solved. At one time, it was a nice place. Many of the caddies and players stayed there during the tournament. We hung around the pool and hot tub and barbequed on the gas grills which were scattered among the property. The rooms, small but well kept, were equipped with kitchenettes which came in handy. Many on tour welcomed the respite, although short lived, from the mundane ‘restaurant every night’ routine. All in all, it was a decent place to stay and the price was right. Back then, management was adequate but by the looks of these travel reviews, things aren’t looking up. Of course, this was a time when the tour was more of a traveling family than a business. The old-timers know what I mean. The newbies can only imagine. I can see the Palm Court still gets its share of press. SWAT robot survives encounter with flying microwave oven Some things never change. 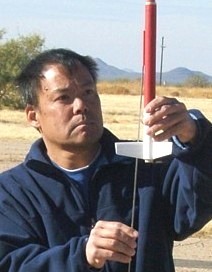 I remember during one of my winter stopovers, “Quiet Dave” (another caddie) invited me to a rocket launch in the desert. He was into model rocketry and the club to which he belonged had a monthly meet to display their wares and ignite a few missiles for fun. When it was Dave’s turn, he opted for a rather diminutive specimen. It had a red streamer attached to help track its flight and aide in recovery. Considering the terrain and gusty wind conditions, every avenue of retrieval was needed or the sands of time (actually the Sonoran Desert) would swallow it for eternity. All systems were go for Dave’s launch and proceeded without delay. In a blink of an eye, the projectile’s short but rapid accent made it invisible except for the fluttering red streamer. We watched intensely, not wishing to loose sight of its return to earth. After landing, we vaguely marked the spot and decided to split up in an effort not to cover the same ground twice. After a few minutes fighting the eye-stinging dust whipped up by the desert wind, our serpentine paths eventually found us face-to-face a few feet apart. In perfect unison we looked down. Me to the right and he left and there it was. As expected, you think it was the errant rocket we found, but no. It was the one thing we would not have expected but, given we were two caddies aimlessly searching for a lost object, should have. What did we find? A a golf ball of course. By the way, it was a Molitor if I’m not mistaken. Never did find that rocket. Looking forward to watching The US Open. By the sound of some of the interviews, Pinehurst will bring them to their knees. Hot and steamy is the forecast. Even better. Debit card scam targets Greater Kansas City residents – Not just Kansas City. I got this call yesterday. This entry was posted on Wednesday, June 11th, 2014 at 4:57 pm and is filed under Uncategorized. You can follow any responses to this entry through the RSS 2.0 feed. You can leave a response, or trackback from your own site. that was a great place everybody by the pool price was right we werenot making a lot of money but life was simpler you one with Kimmy Rick won with Gabs. correct? I won with Kimmy in Springfield but I think you got The Garb correct. Those were really good times. I still remember when Ann Marie killed that duck that was flying over the pond on #9. Thanks for the great memories. Tucson was always a great tour stop. Especially Happy Hour in the bar across the road. in Danvers Mass. Deduct one year of life expectancy for every question you can’t answer!! ?? # 6 What tournament and motel did the manager roast a pig 2 years running? And also provided sausage biscuits (free) on tournament mornings? Of course returning for year 3, we found out that he had skipped town with cash and some of the motel’s fixtures! Let me also put in a vote for Tuscon’s Palm Court Inn. Most economical winters I ever spent! The answer to Danno’s question is: Atlanta Chick-Fil-A at Eagles Landing CC…. 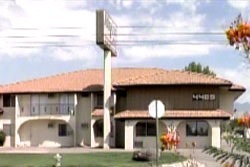 Super 8 Motel …. We also got to know the cart barn very well as there were downpours almost every year. I think a bar in Springfield, Illinois used to have a pig roast also.